A bit of self-promotion here, but hopefully a useful tip too. It’s to flag that, this summer, there’s a particularly strong reason to base your qualitative fieldwork in the Midlands or North, rather than the South-East region. And get me to do it, obviously. Many of us will have received another Transport for London email this morning warning us about the traffic and transport problems expected in the capital in late July / August, when the London Olympics take place. So for researchers or clients considering qual fieldwork at that time, why not avoid it all and do the groups in Birmingham, Manchester, Sheffield, or any of the other fine “viewing-facility ‘n’ good recruiter” cities? You get easier recruiting and less risk of no-shows; the interviewer or moderator will be able to get to fieldwork on time; and you’ll generally avoid all the stress of London’s busiest month. What’s that you say, oh London-based research manager type person? You can’t be a***ed schlepping up to Brum or Manc? But here’s the beautiful thing: you don’t need to! I can do it for you. For, being based in the South Midlands hub of Oxford, the geographical centre of the nation*, I can take care of the fieldwork (and analysis and reporting for that matter) while you dodge stray javelins and give up your seat on the Tube to the Peruvian modern pentathlon team. It would be a fitting tribute to the Queen on her Jubilee and to our fine Olympians if agencies were to commission me to carry out extensive programmes of qualitative research fieldwork in the Midlands and North during July and August. I can think of no better way of crowning Britain’s summer of glory. 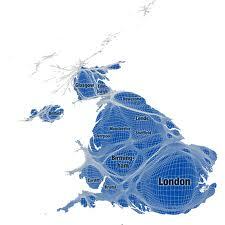 From Daily Telegraph: UK map as adjusted to reflect relative populations by region. Proof that Oxford is a reasonable place for a qualitative researcher to live. * not technically true. The centre’s probably nearer Sheffield. But with the disproportionate weight of population in the South East (20-25 million in that corner alone), Oxford can claim to be close to what geographers might call (but never have) the Populational Centre of Gravity of Britain. P.S. a fascinating Riley Family Olympic fact: my mum attended the last London Olympics in 1948. She came all the way from Strabane, Northern Ireland to London to watch the Dutch “The Flying Housewife” Fanny Blankers-Koen et al breaking records while having to eat their own ration books and graze in the fields for sustenance. This entry was posted in 21st Century Britain, Qual Research, Shore and tagged Birmingham, Britain, British, fieldwork, London, Midlands, Olympics London 2012, qual, qualitative research, society. Bookmark the permalink.